You can have an exclusive spot on the front page and beat the competition once again! Act quickly to join this exclusive club of only 9 of Kitsap’s best advertisers. Your budget will love Tidbits! You will smile and shake your head yes when you see our rates. Need only a business card ad? Your ad will be seen by thousands of people every week for a very small investment! Unlike some publications, we’ll design your ad ABSOLUTELY FREE and BEFORE you agree to buy anything! 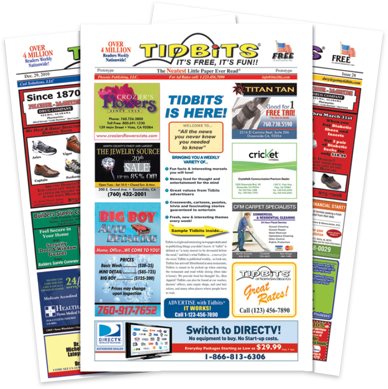 I consider it a privilege to publish Tidbits in our area and treat it as a responsibility to help my fellow business owners market their business.